Soon, prospective students staring at their mobile phones on your campus may not be texting their BFFs, but participating in a game that’s designed to introduce them to the college—and increase their interest in applying to and attending your institution. Early adopters in admission offices across the country are experimenting with SCVNGR, a mobile gaming platform, for a variety of admissions-related purposes. Their experience suggest that teens—and parents—enjoy a challenge while they’re visiting campus and participating in other activities. SCVNGR is used by more than 400 colleges and universities around the United States, museums like the Smithsonian, art galleries and businesses like Dunkin’ Donuts. Participants in a SCVNGR trek take part in challenges (e.g. take a picture of the library clock and upload the image), earning points for each challenge. SCVNGR can be played on any mobile device via text message or by using a free iPhone or Android app. A trek consists of a number of linked challenges. Participants can play casually by taking part in a couple of challenges or they can play more seriously, competing with each other to accumulate points, often in order to win prizes. Colleges and universities develop SCVNGR treks for many purposes, including alumni engagement. Given the teen penchant for video games, it’s unsurprising that admissions offices are looking closely at it. Here are some ways in which admission offices are using SCVNGR. Both Clarkson University and Penn State University created SCVNGR treks to give attendees at admissions events something to do that’s less structured than the typical agenda. “At Clarkson, our goal was to teach participants things that they wouldn’t hear on a campus tour or learn throughout the rest of the day.” said Jessica McPherson, a staff member in marketing and external relations. “We had approximately 600 students and their families on campus for a jam-packed day of events. Knowing the schedule, we decided that if we were going to have a SCVNGR trek on such a busy day, it would have to coincide with event locations and stay quite simple.” The trek had five challenges in three different buildings. At Dartmouth College, SCVNGR treks are being used to augment in-person campus tours. The admissions office at Dartmouth created seven SCVNGR treks, highlighting different aspects of campus life so that visitors have something to do when campus tours aren’t operating. In a post on the Wired Campus blog, Josh Keller observed that Dartmouth tours simply can’t accommodate the more than 20,000 campus visitors each year. Using SCVNGR, Dartmouth develops treks around special-interests like sustainability in addition to highlighting campus landmarks like the library. 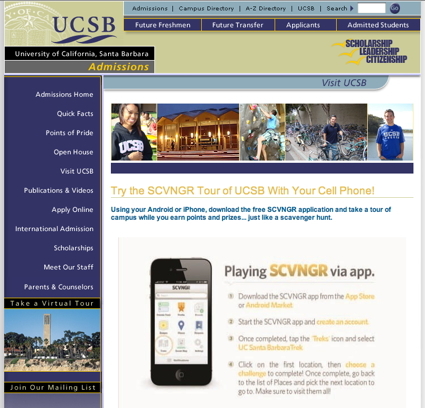 Other institutions, like the University of California Santa Barbara, offer links to SCVNGR right from their campus tours website. Both McPherson and Spinelle commented on the importance of awarding prizes for playing SCVNGR. Clarkson University erected a booth in the student center to distribute prizes to players, handing out a variety of Clarkson items such as Frisbees, coffee mugs, bumper stickers and pen sets. Penn State gave a small prize to anyone who stopped by its social media table and showed that they had completed at least one challenge. Each day, it picked one person from the competitors to receive a gift bag of Penn State and SCVNGR t-shirts, water bottles, sunglasses and other swag. Advance publicity and on-site help with how to use SCVNGR boost participation rates. Penn State started promoting its trek a few weeks before the actual visit day using Facebook, Twitter and an email reminder that went to students who’d registered. Both Penn State and Clarkson produced small flyers explaining the trek and how to participate.